This is our essential Music Together class is for children birth to 5 years. A child can attend our Mixed Age classes through all nine song collections. This class follows the recommendations of child development researchers - grouping together children of a variety of ages because this fosters natural, family-style, community learning. Younger children can enjoy watching and imitating older ones; older children, not quite ready for formal instruction, but old enough to participate in class completely independently, can build confidence and learn by leading the younger ones. Adults are happy because several children in a family can go to class together. Each child participates at his or her own level in singing, moving, chanting, listening, watching or exploring musical instruments. Any caregivers - parents, grandparents, nanny - can bring the children. The whole family is welcome for this community friendly, family music experience. Materials include 2 professionally recorded CD's, and a beautifully illustrated songbook. New families also receive a DVD and parent guide. 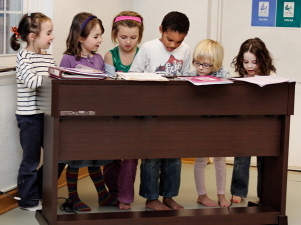 Music Together Big Kids® (FOR 5, 6 AND 7 YEAR OLDS): Classes meet for one hour once a week in a ten week term. Parents are welcome to join us for all classes, but are requested to attend both the first and final class of the term and the last 15 minutes of every class. This way parents are in touch with what we are doing in class. Big Kids classes lay the foundation for Basic Music Literacy, complementing music instruction in school or instrument lessons, and leading to a lifetime of joyful music-making. The curriculum includes solfège, solos and ensembles, folk dances, harmony singing, vocal development, and drumming. In a safe, fun environment, your child can experiment with new activities like conducting and improvisation, story songs, and game songs. Materials include 2 Cd's, a family songbook, parent education materials and activities to take home. Music Together's BIG KIDS JAMMIN' (FOR 5, 6 AND 7 YEAR OLDS): Classes meet for one hour once a week for 6 weeks and is intended to be an introduction class to our Music Together Big Kids program. Parents are welcome to join us for all classes, but are requested to attend both the first and final class of the term and the last 10 minutes of every class so that they can be informed about what we do in class each session. Our Big Kids classes lay the foundation for Basic Music Literacy, complementing music instruction in school or instrument lessons, and leading to a lifetime of joyful music-making. The curriculum includes tonal and rhythmic solfege, solos and ensembles, folk dances, harmony singing, vocal development, and drumming. In a safe, fun environment, your child can experiment with new activities like conducting and improvisation, story songs, and game songs. Materials include a CD, a family songbook, parent education materials and children's activities to take home. Our Generations class is like that of Mixed Age/Family. * The difference is that the class is shared with senior residents living in the facility where class is held making our essential class even more of a community experience. (The photo posted here is from a class at the Ivy Lodge Assisted Living in Saugerties. The residents love being with the families and observing the children and the families bring their children to share in a true intergenerational and musical exchange. Currently there is a class running at The Thompson House at Northern Dutchess Hospital in Rhinebeck. For more information about any of our classes, please contact Miranda at 845-657-2600 or click on contact us on the home page to reach us by e-mail. Thank you! There are two groups for Rhythm Kids; Level I and Level II. The first is for children 4 - 5 years old. This class is the next musical step for your preschool child with a parent or caregiver. Each week we drum, sing, dance, play rhythm instruments, and begin to play music-based games. Rhythm Kids 4 - 5 guides children toward developmentally appropriate music and movement activities, where they can begin to take charge, lead others and be musically creative. If you have never taken a Music Together class with us before, we invite you to come to a sample class to get a sense of what to expect in a regular class. Sample class are 1/2 hour (our regular classes are 45 minutes long) and it is all music making but for a bit of discussion about our philosophy. This program is for parents of infants only. Reservations are required. To schedule a sample class please go to the home page of the website (About Us), click on Sample Class Scheduler and follow the prompts. Or call us at 845-657-2600. Thank you! Please see description for Mixed Age/Family classes. Join us for a week of singing and dancing this summer. This is an opportunity to get a feel for what our classes are all about. Classes are age and developmentally appropriate for children birth to 5. Learn songs with the whole family that will last an entire lifetime. Materials for our Summer Songs 2 song collection are included in the fee. Materials include a CD, a songbook illustrated with our beautiful woodcuts, and a code that will take you to our Family Music Zone online. At the Family Music Zone, enjoy the additional activities to do with your child. Join us for 4 classes of singing and dancing this summer. This is an opportunity to get a feel for what our classes are all about. Classes are age and developmentally appropriate for children birth to 5. Learn songs with the whole family that will last an entire lifetime. This is our essential Music Together class is for children birth to 5 years. A child can attend our Mixed Age classes through all nine song collections. This class follows the recommendations of child development researchers &S211; grouping together children of a variety of ages because this fosters natural, family-style, community learning. Younger children can enjoy watching and imitating older ones; older children, not quite ready for formal instruction, but old enough to participate in class completely independently, can build confidence and learn by leading the younger ones. Adults are happy because several children in a family can go to class together. Each child participates at his or her own level in singing, moving, chanting, listening, watching or exploring musical instruments. Any caregivers &S211; parents, grandparents, nanny &S211; can bring the children. The whole family is welcome for this community friendly, family music experience. Materials include 2 professionally recorded CD's, and a beautifully illustrated songbook. New families also receive a DVD and parent guide. Each term we introduce a new song collection. This spring is TIGER. Each week we drum, sing, dance, play rhythm instruments, and begin to play music-based games. Rhythm Kids 4 - 5 guides children toward developmentally appropriate music and movement activities, where they can begin to take charge, lead others and be musically creative. Rhythm Kids K - 2 is a movement, and drumming class for children in which children integrate and assimilate rhythm into their lives through drumming and pattern play. As part of the Rhythm Kids experience, children and their grown ups can enjoy drumming play and practice session at home with the help of online play-along videos featuring Rhythm Kids creator Tom Foote. Rhythm Kids follows through on the Music Together vision to help children complete the pathway of early childhood music development from birth through age 8.